A new lawsuit accuses Apple of participating in "unfair, unlawful, deceptive, and misleading practices" in promoting the simplicity and reliability of its iCloud service. 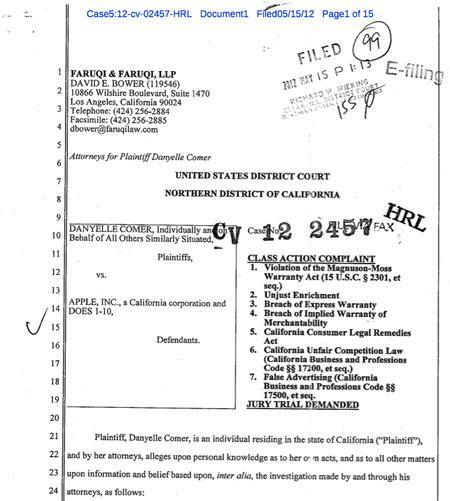 The complaint was filed this week in U.S. District Court for the Northern District of California by plaintiff Danyelle Comer and discovered by AppleInsider. The filing expresses dissatisfaction with Apple's transition from the paid MobileMe service to its successor, iCloud. "Throughout the migration, Apple failed to adequately ensure that features MobileMe users were paying for would be accessible, including access to their e-mail accounts for which customers pay additional fees," the complaint reads. "As a result, numerous MobileMe users suffered damage from the inability to access their individual accounts." The lawsuit asserts that Apple "misrepresented" its iCloud service in advertising it to customers. Specifically, it argues that paying MobileMe customers experienced "devastating consequences," and that Apple should have been better prepared for the transition. "Unfortunately for many users it doesn't 'just work' and has resulted in a series of headaches due to lack of syncing ability, lack of email functionality and other complications and losses and corruption of data," the suit states. "In fact a number of users have been forced to hire outside technical assistance at significant cost, just to migrate to the iCloud platform or get around it to obtain minimal functionality of emails and other systems." The complaint cites an AppleInsider report published last October that detailed the inability of users to merge their Apple IDs as causing some issues in the transition from MobileMe to iCloud. Some readers had reached out to share their frustrations, such as one person had used one Apple ID to purchase applications and music that was separate from the e-mail address used for their preexisting MobileMe account. They were left in a position to choose between the e-mail address associated with their MobileMe account, or the Apple ID they used to purchase content. The lawsuit also focuses on iCloud downtime causing an inability to access e-mail and other services. It accuses Apple of indicating that iCloud and MobileMe e-mail accounts are online and operational, when in fact users are unable to send or receive e-mails. "Apple's most dedicated consumers, including those who paid for MobileMe service have continually experienced problems with iCloud migration, including lack of email for extended periods," the complaint reads. The class-action suit accuses Apple of one count of violation of the Magnus-Moss Warranty Act, one count of unjust enrichment, one count of breach of express warranty, one count of breach of implied warranty of merchantability, and violation of the California Consumer Legal Remedies Act.